The Iraqi Governing Council is accusing Iran of helping fund terror activities in Iraq. How much truth is there to this? 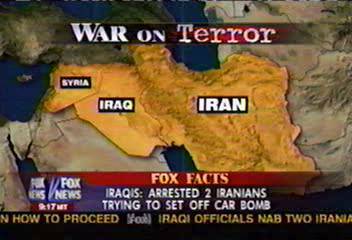 Just today a couple of Iranians were arrested in the country, suspected of trying to detonate a car bomb. 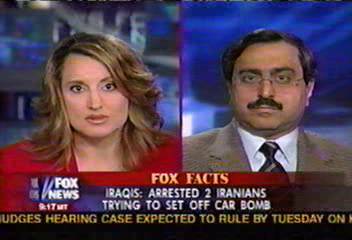 I want to talk about this, this morning with Alireza Jafarzadeh, Fox News foreign affairs analyst. ALIREZA JAFARZADEH:: Good morning Brigitte, happy Fourth of July. BRIGITTE QUINN: Well, same to you and as we see we hope we see freedom and democracy be able to sustain itself in Iraq. Why would the Iranians not want that to succeed, is it that they are afraid of a revolution from within in their own country? ALIREZA JAFARZADEH: Certainly they do, Iran has already been in trouble, there are all kinds of anti-government demonstrations, there is a lot of opposition going on inside Iran, there is an organized resistance movement against the regime. So they are afraid that if there is progress, peace, and stability in Iraq that would mean bad news. And by extension if they can continue building a chaotic, unstable, and a violent environment in Iraq that would provide room for extremism to grow. So their intention is to establish an Islamic republic modeled after Iran, in their next door neighbor. BRIGITTE QUINN: So, do you believe that they are trying to help the insurgency in Iraq? ALIREZA JAFARZADEH: Well they have been doing this for months. I have been talking about this since last year on Fox News. They have been funneling money, sending arms, sending their own agents into the country, providing training to a lot of these extremist groups. Under the cover of pilgrims, thousands of Ministry of Intelligence agents were sent into the country, they have had thousands of clerics who were studying in theological schools in Qom and Mashad who are all now back in Iraq inciting violence, building anti-Americanism, and support for Iran. BRIGITTE QUINN: You said anti-Americanism. Now that we have an Iraqi government, might they stop? ALIREZA JAFARZADEH: Well, I think that this might even cause them to work even harder because they have already called this government a lackey of the United States. They don’t want to see this government to consolidate its position, so they are at work day and night and they want to make sure that this government wouldn’t succeed. That’s why I think that it was good news when we heard that some authorities within the Iraqi Interim Government are now recognizing this and are now talking about the threat coming from both Syria and Iran but particularly from Iran, and I hope that is coupled with very solid and decisive measures on the part of the Iraqi Government. BRIGITTE QUINN: You mentioned Syria. There is a story this morning that within Syria and within Jordan we have a network of Saddam Hussein’s cousins who are trying to make trouble in Iraq. Is there anything that the Iraqis can do to stop these people? 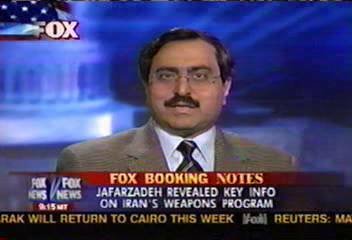 ALIREZA JAFARZADEH: Well, certainly I think the Syrians have been involved. They have a good relationship with Iran, interestingly. The Syrian President was in Iran on Sunday and they have pretty much a common position regarding Iraq. So certainly I have no doubt that they have been involved in inciting violence there. But what is important is who can really benefit out of this situation, who is the most benefactor of this situation? I think, by far, Iran holds the bigger sway in the future political process in Iraq. They are a much bigger country, they have a much longer border with Iraq some 900 miles in compared to Syria’s 400 miles and the population of Iran is much bigger, 70 million compared to Syria’s 18 million. They have a bigger influence on the Shiite community in Iraq, particularly in Najaf and Karbala and they have had their own network already built and in place in Iraq. They have a number of groups that they have been sponsoring. So, we have to be very very careful about what Iran is up to. BRIGITTE QUINN: Okay, Alireza, thank you very much. ALIREZA JAFARZADEH: Thank you very much, Brigitte.